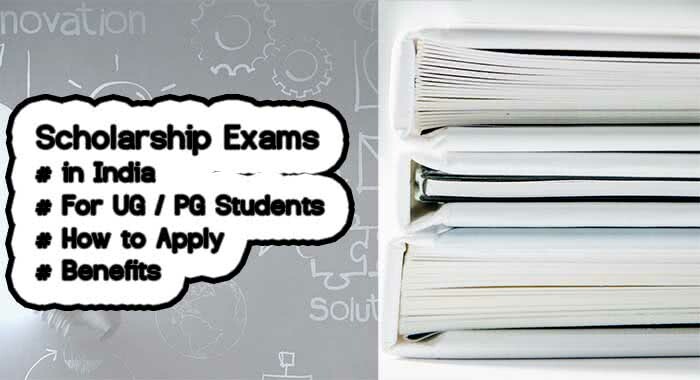 Scholarship Exams 2019: There are many Scholarships which are provided to the students for their further studies. But many of the aspirants are unable to access and get information about those Scholarship Exams in India. They can check all the information about the Scholarship Exams 2019 below in the article. The aspirants can check the eligibility criteria before applying for the Scholarships 2019. Every student has a dream to study in a good and reputed college in India or Abroad but they are unable to pursue their studies because of their financial conditions. So many governments and the non-governmental organization provides scholarships to such eligible candidates to make their dreams true. The aspirants can check all the details about the Scholarship Exams in India 2019 given below in the table. The students can apply for any scholarships exams according to their eligibility. The Scholarship exams for Indian students are conducted to provide some support to the students of lower class or have good academics. If any aspirants have any doubt or query regarding the Scholarship Exams 2019 for Indian Students, they can contact us by commenting in the comment section given below. The foundations which are providing Scholarships for Indian Students have an eligibility criterion for each and every scholarship program. The students who want to study abroad and are notable to meet the financial status can apply for various Scholarship exams which are conducted every year. There is a different criterion for the students of engineering. The Scholarship for Engineering Students is provided on many bases like cast, merits, financial conditions etc. The students can get all the information about the scholarships which are awarded to the aspirants to complete their studies in India or Abroad.